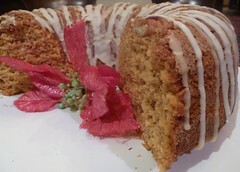 The Southern Vegetarian Chronicles: Louisiana Sweet Potato and Pecan Spice Pound Cake: A Lesson for the New Year. Louisiana Sweet Potato and Pecan Spice Pound Cake: A Lesson for the New Year. On this last day of 2010, I reflect back on the past year. Actually the past eight. That is how long it has taken me to perfect my vegan cakes. I have practiced and finally found a formula that works. So now I can apply it to chocolate cakes, vanilla, spice, etc. You know every year people come up with resolutions that usually get kicked to curb by April. But taking a lesson from my cake adventures, never give up. Every flat cake helped me come up with new ideas and formulas. When you find a formula that works, keep working and improving on it. Every year is a great learning experience and this year has been no exception. I started this Southern Vegetarian adventure about a year ago and I plan to keep on cooking and learning in the new year. Check out one of my masterpiece cakes below and don’t give up on your goals and dreams in the New Year!